The hydrologic cycle (California Department of Water Resources). 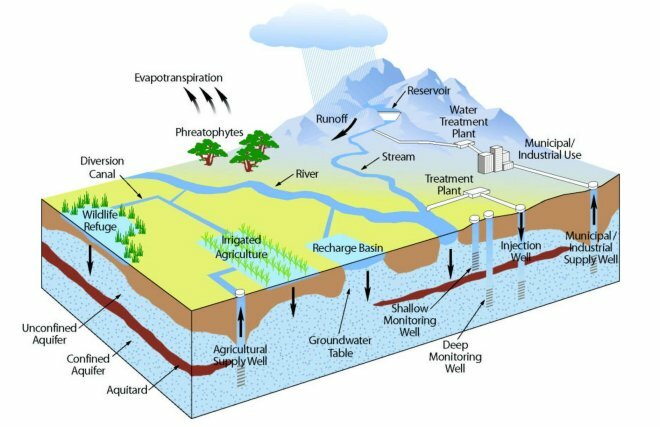 Develop approaches for sustainable groundwater management and identification of new water resources including groundwater storage opportunities while reducing associated cost and energy demands and insuring water quality. Anticipate, assess, manage, and mitigate potential impacts of emerging energy technologies on water systems and quality. Water-Energy is an Energy Geosciences Division initiative within the Resilient Energy, Water and Infrastructure Program Domain.